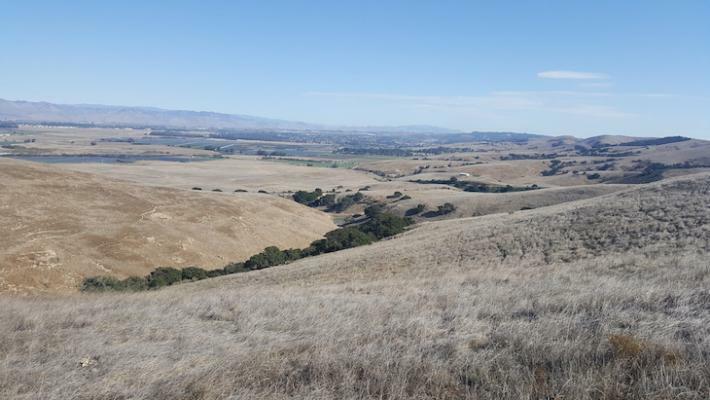 The Land Trust for Santa Barbara County joined with Betteravia Farms, LLC, the Santa Maria grower of Bonipak produce, in a deal that conserves prime wildlife habitat and grazing lands in the hills west of Orcutt and clears the way for expansion of agriculture along Hwy 1. Betteravia Farms dates back to the 1930s when friends Milo Ferini and Dominick Ardantz recognized the exceptional potential for agriculture in this area, and started a small sugar beet farm that has grown over the last 87 years into one of the county’s largest agricultural operations. Now managed by second and third generation family members, and with more than 600 other local employees, Betteravia Farms grows a wide variety of fresh produce that is shipped throughout North America. The success of this project is directly related to a collaborative approach on the part of the U.S. Fish and Wildlife Service and the California Department of Fish and Wildlife who recognize that conservation of habitat in Santa Barbara County is best achieved through engaging with landowners and understanding their challenges. The Betteravia Farms conservation project represents a new, more collaborative approach. The Land Trust, working in partnership with these agencies, has developed a model that assists willing landowners seeking to increase their bottom line—and conserves habitat for wildlife. “The Land Trust recognizes that private farms and ranches throughout the county offer incredible habitat, as well as food for our community. The best way to maintain that habitat is to keep those family lands in family hands. We are grateful to the Betteravia Farms families for their willingness to engage with the Land Trust and our partner agencies to try something new,” said Chet Work, Land Trust Executive Director. Since 1985, The Land Trust for Santa Barbara County has worked with community groups, willing landowners and others to conserve, restore, and manage open space, wildlife habitat, and family farms and ranches throughout the County. To date, the Land Trust has helped to preserve more than 27,000 acres of natural resource and working land, including the Arroyo Hondo Preserve, Point Sal, Sedgwick Reserve, and the new Rincon Bluffs Preserve. Visit https://www.sblandtrust.org for more information. As an exclusive marketer for Betteravia Farms, Bonipak has been committed to sustainable growing practices and ensuring the best quality for its customers through its seed-to-sale approach. The company grows, harvests, cools, processes and ships millions of cartons of fresh vegetables to retailers, wholesalers and food service customers throughout North America. For more information about Bonipak and its products, visit https://www.bonipak.com. The Ventura Fish and Wildlife Office, a field station of the U.S. Fish and Wildlife Service, works to conserve and protect threatened and endangered fish, wildlife and plants across the central and Southern California coast, collaborating with communities and conservation partners to build a future that supports both people and our unique and diverse natural resources. For more information on our work and the people who make it happen visit http://www.fws.gov/ventura. As a 4th generation Native Californian I am always thrilled when hearing about land protected from development. Indeed, we do NOT want or need wall to wall development. Just have a look at everything from Ventura on South... We need to protect and preserve not only our open spaces, but especially our endangered species! Thank you, Land Trust, for helping us do just that. Hey edhat staff, can you get us some information on the actual project rather than this cheerleading? What? Where? There is lots of land west of Orcutt and a good bit along Hwy 1. When? How? Sure is an enthusiastic press release, though uninformative. Scroll up to the top of the article, it says Source: Land Trust. It's a press release from the Land Trust. If it was written by edhat staff it would say "By edhat staff"
Edhat did a great job letting us know about this. There's more info out there should you choose to use your keyboard and will to live (e.g. Santa Maria Times, KSBY) . Thanks, Betteravia. And thank you to the Land Trust for all the acres, including our Rincon Bluffs (Thunder Bowl), you have helped preserve. We don't need wall to wall development taking up every inch of former open space.